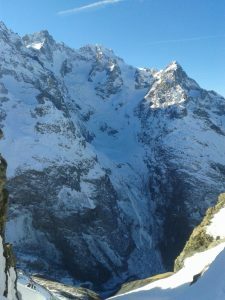 The Col de Laurichard from the north east is deservedly one of the most popular ski tours in the Combynot nature reserve. Like several routes on this site it starts from the Col du Lautaret giving you the advantage of being able to start at over 2000 metres. 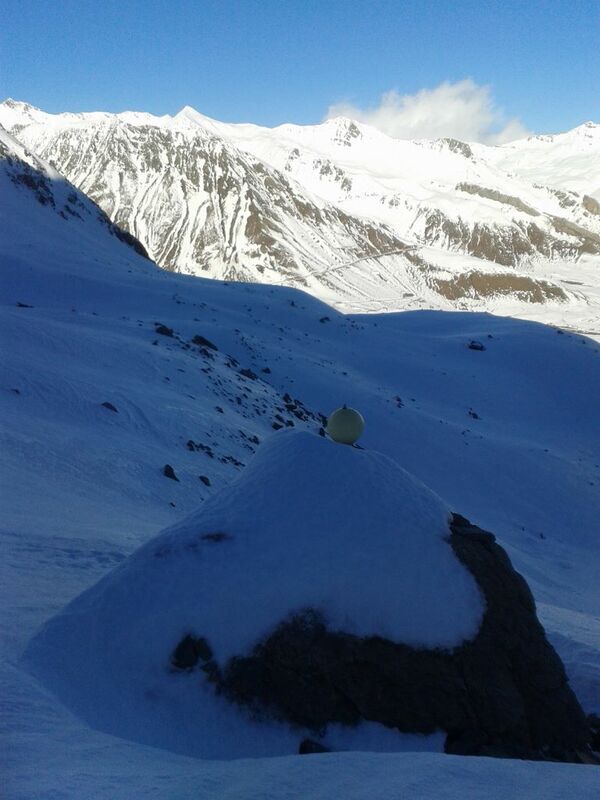 The Combeynot range is always popular with ski tourers and even in poor weather it is rare not to see other people. On this sunny Saturday morning we saw five or six parties skiing the route as well as a large group doing avalanche rescue training. On weekday visits with thoroughly miserably weather I have still seen other parties out skiing. Although well frequented for the region, the route never gets so busy that you are queuing, or racing to get to the top after a snowfall before it gets tracked out. The ascent is beautiful, but neither long nor difficult. 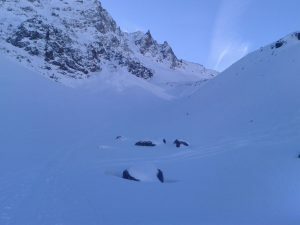 In fact the Col de Laurichard is one of the most accessible ski ascents around the Lautaret. From the car park, the route heads due south around Serre Orel and climbs to a flat area at the start of the Combe de Laurichard. This short, attractive valley divides the Pyramide de Laurichard from the rest of the Combeynot range. The Combe is followed south-west to its head where a steep climb leads to the Col and a breathtaking view over the steep drop beyond. On the way up there are a number of boulders with plastic balls attached to them (see final photograph). If anyone can enlighten me as to the purpose of these please let me know. I have absolutely no idea what they are for. The ski down has to be by the same route. The far side of the Col is not skiable so a traverse is sadly not possible. The short, east facing approach to the top gives the steepest skiing of the descent as you drop back into the Combe. After this there is a choice between the north and east facing sides of the valley, with the easterly aspects being a little steeper. On this occasion we traversed left to stay on the east facing slopes. The south wind of the previous few days had produced some windslab potential which we wanted to avoid. A good but all-too-short fall-line ski brought us to the floor of the Combe, just above the flattening that marked its end. 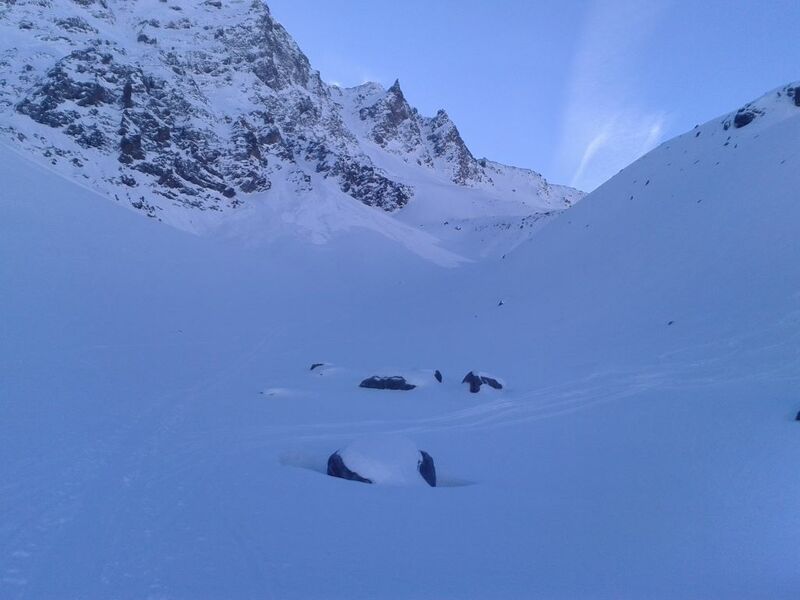 On leaving this, the undulating lower slopes gave a good ski on north facing powder back to the starting point. I always enjoy the final part of the descent here where the slopes are covered with runnels, knolls, little ridges and the occasional tree. 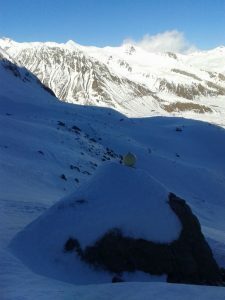 The slopes skied on this route are quite sheltered and tend to be shaded by the steep surrounding peaks for most of the winter. This means that good powdery snow conditions can often be found but beware of windslab. Despite their popularity these slopes can be avalanche prone, and the Lautaret area is often windy. Care is needed as always in choice of route and knowing when to turn back.